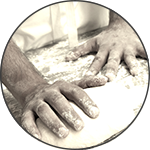 Created to promote around the world the classic Neapolitan pizza, defending the characteristics of the product from its origin to the present. AMD comes from the large experience of pizza master. Mr. Attilio Albachiara, President, World Champion Pizza STG 2015. Played for two Editions in the cicy of Acerra, where the mask of Pulcinella is born, later, thanks to the great success, the event moved to Naples, where the art of master pizza is handed down from father to son. Do you want to expose Pizza Masters Table? Find out how to get it respecting the AMD disciplinary.